Waiting in line at a Chicago coffeehouse, I look at the upcoming events for a small venue. The month’s calendar is populated by bands that I have never heard of. While not to consider myself musically out of touch, the situation presents itself as how director David Chase may want audiences to approach his film. If I were to take any band listed on that calendar I saw, I’m certain they would have a story to tell. Much the same, the central characters in Not Fade Away have a story – it’s one of yearning for immortality. Much like Stephen Chbosky’s The Perks of Being a Wallflower, David Chase’s directorial debut resonates largely for its nostalgic glow. With Not Fade Away, Chase’s utilization and appreciation for an era is deconstructed for its more primal aspects. The Kennedy assassination and Martin Luther King Jr. film the background of the picture; it’s the music which shapes the culture of the characters on display. But as the material may lend itself to grandiosity, there’s a very earnest attempt to ground the material for its most universal qualities. While Not Fade Away never finds the proper tonal balance it strives for, there are many elements of the picture that pulse with genuine humanity. The messy tonal element is largely a byproduct of its problematic two-act structure. The film’s first half suffers from a series of nostalgia-gazing moments that threaten to overwhelm the picture’s plotting. From an opening sequence that details the origins of the Rolling Stones to the rocky rise of Douglas (John Magaro) as a wimpy high-schooler turned garage band lead man, there are numerous forced attempts to capture the aura of the time period without saying much about it. With Bella Heathcote as his muse, Chase often lingers on her facial expressions in close-ups as a means of establishing the rollicking sense of pleasure one can derive from the music of the era. But it all begins to wear thin as the characters age and move into separate narrative detours before reconverging. What this initial act establishes more than anything is Chase’s attempt to get a handle of his numerous characters. There a middling sense to where he wants to go at the picture’s midpoint, whereupon he finally navigates out of the rocky terrain into something a bit more refined. 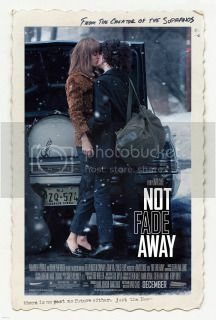 Not Fade Away eventually settles into a more interesting and universal narrative course once Douglas’s father, Pat (James Gandolfini) occupies the screen. At the picture’s Q&A, Chase admits to not knowing where to go with the character initially until envisioning Gandolfini playing the part. The familial narrative that Chase develops between Douglas and Pat is by far the picture’s most effective element. Uniting cultural and societal issues into a strained father-son relationship, Chase complicates the emotional terrain for the better. The picture develops into something about the nature of accepting responsibility, the unavoidable nature of disappointment, and a yearning for immortality. Not Fade Away may feel like several movies all stuffed in one (perhaps lending itself to being a better television show than a singular motion picture, as per Chase’s roots), but individual moments possess significant weight.